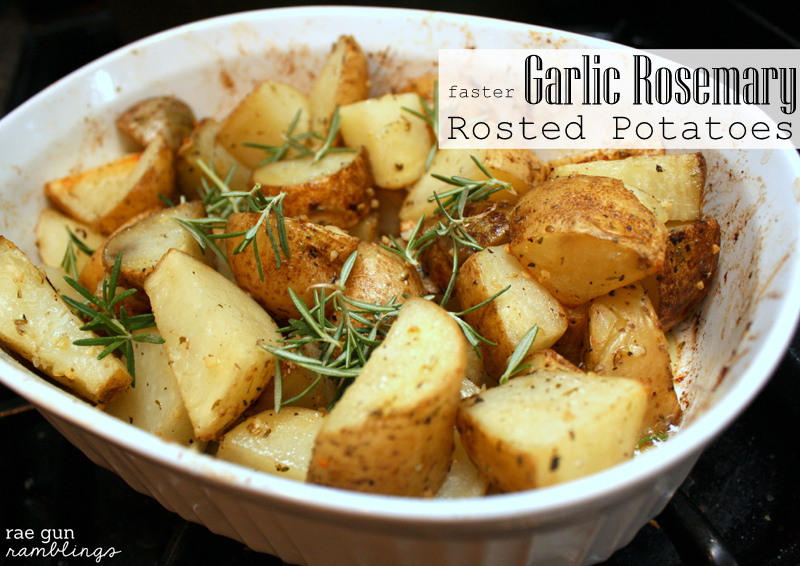 I make these garlic roasted rosemary potatoes to go with everything. They are our go to side when eating meat fondue, I serve them a long side chicken sausages, oven fried chicken you name it they go well. Also they are easy and I usually have everything on hand. I like the roasted flavor but I’m super impatient so I like to help the process a long faster. This is one of those recipes that I just throw things together so feel free to adjust to your family’s tastes. When it’s just us two I do 2 potatoes, 1 tsp butter 1 tsp olive oil, 1/2 tsp garlic, 1 sprig rosemary, salt and pepper. In the picture I took this to a family meal (maybe Easter last year?) 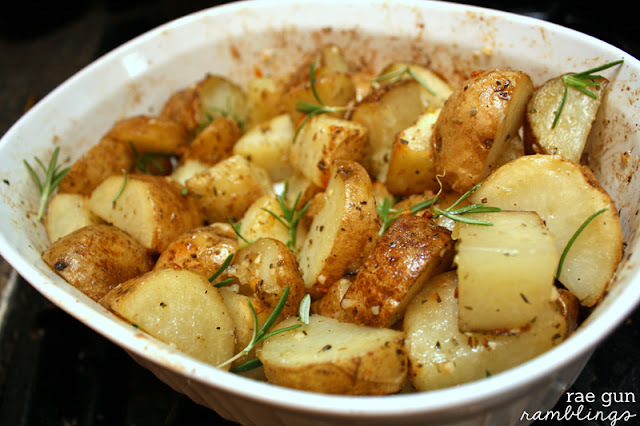 and I used 6 potatoes, 1 heaping tablespoon of garlic, 2 TBS butter, 1 TBS olive oil, 3 longer sprigs of rosemary. 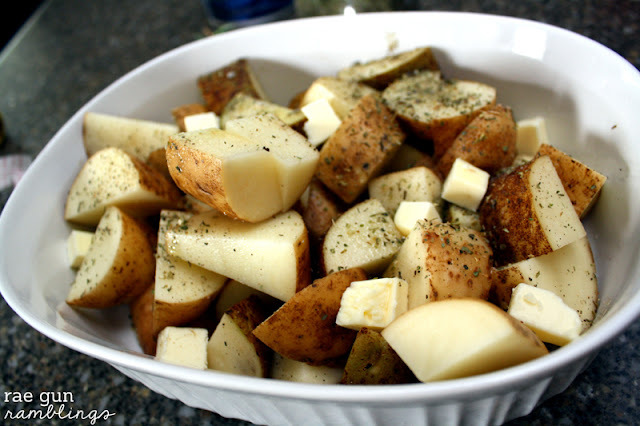 With scrubbed potatoes cut to about 2 inch sized pieces. In microwavable container (I’m lazy I use what I’ll bake them in) put potatoes tossed with olive oil and butter chopped and spread out. Some times I add a shake of Italian seasoning at this step. Microwave for 2 minutes. Stir microwave for an additional 3 minutes. Stir sometimes I do another round. Add garlic, rosemary (broken into small pieces), and salt and pepper. Stir. Bake at 450 for 20-30 minutes or until potatoes are cooked through. These look so yummy! I pinned these so I can make them later. My family would love this! Got you from The best blog recipes and Ginger Snap Crafts. Pinned this too! 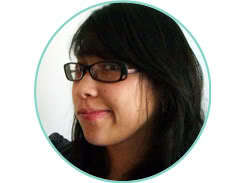 Hopping from Diana’s pin me link up, too! Yum, these look so delicious! My wonderful friend Heather & I started a linky party & I would love to have you come link up! > http://www.kaylascreationsblog.com/2013/04/circle-of-faith-link-party-1.html Hope to see you there! These look delicious! 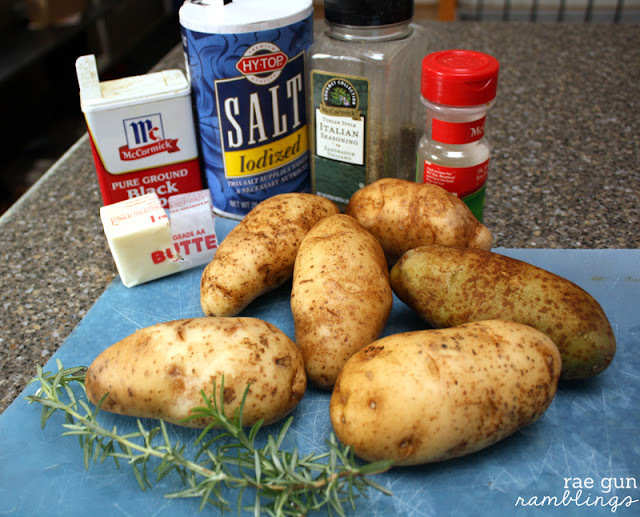 Can’t wait to try them…I love rosemary and potatoes, they just seem to belong together. Yummy! Oh I love rosemary on potatoes – I have a big rosemary bush just outside the front door and am just waiting for the new potatoes to come in.